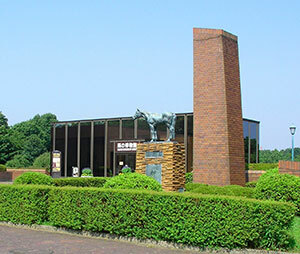 At the Equine Museum of Japan, our permanent exhibits and plan exhibits introduce the visitor to a wide variety of items born of the relationship between horses and people. This includes history and natural history, folklore, arts and artifacts, and horse racing. In the spring and autumn, we also present special exhibits the examine past, present, and future relationships between horses and people in depth from a variety of angles. At our Pony Center, visitors can befriend horses by actually touching various breeds such as thoroughbreds, native Japanese horses, and ponies, and they can observe how horses are cared for. These facilities, Equine Cultural Affairs Foundation is run. 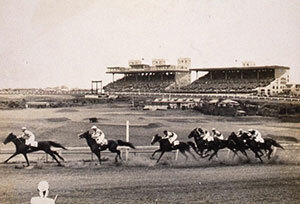 Western-style horse racing began in Japan during the 1860s at Yokohama. Following the completion of Negishi Racecourse 1866, horse racing took place there for 76 years, ending in 1942. 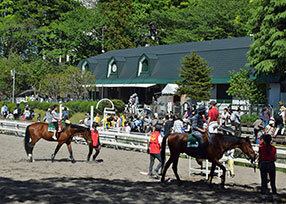 Negishi Racecources began as an entertainment venue for foreign residents in Yokohama, but eventually became a bustling social arena that welcomed Japanese. It became a model for other racecourses later built in Japan. Equine culture began about 5,000 years ago when people in Central Asia invented the bit, a revolutionary device that allowed humankind to control horses. This culture entered Japan during the Tumulus period. 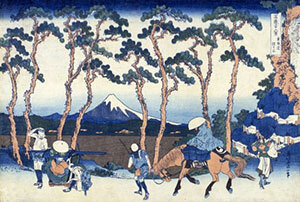 Japan's equine culture originally developed in association with the noble and warrior classes. Harness, paintings, and prints, and crafts with horse motifs can all offer us glimpses of the status of the horses in society. Horses have long been a favorite theme of artists. When we see their work, we can sometimes sense the same inspiration they felt when creating them. The forerunners of horses appeared about 55 million years ago during the Cenozoic era. In Exhibit room 4, visitors can follow the history of the horse from the evolution of distant ancestors to domestication. Visitors can also learn about the physiology and their histories. Also you can learn how to tack up and measure your own horsepower. 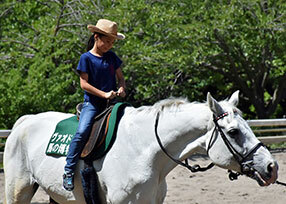 Tour our riding ground and pasture to learn about horse riding and husbandry. 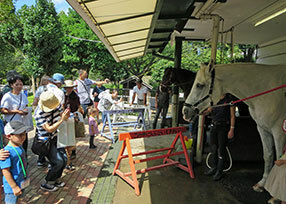 Get to know horses through our regular events. The time may change due to the weather, etc. Every Saturday 1:30 p.m. to 1:45 p.m.
From Negishi Station , take city bus no.21 for Sakuragi-cho Station, take city bus no.21 to Takinoue. From Yokohama Station east exit, Hinode-cho Station, or Isezakichoja-machi Station, take city bus no.103 to Takinoue.